This semester the library will be renovated to include a coffee shop, a more accessible Center for Student Success and new furnishings to better adapt to the wants and needs of all the students at SNU. To get a better understanding of what SNU students should be expecting, I interviewed Katie King, the Director of the Library, and Scott Strawn, the Vice President for Business and Finance. Scott Strawn, Vice President for Business and Finance: Our goal is to start construction by the October. It will probably be a five month project. Katie King, Director of the Library: Scott’s estimate is the best we have to date (he’s the project director). What will let us know construction is about to get serious? Katie King: There will be several indicators: first, we’ll have electrical work done over Fall Break. At this point, we plan for the entire Library to be closed Thursday, October 16 through Sunday, October 19. Hopefully, if all goes as planned, we’ll reopen normally on Monday, October 20. Then, you should see the construction crew erecting an emergency staircase on the north side of the Library and beginning the buildout of the Fred Floyd Archives on the the first floor, south side. You’ll also see construction walls go up on both the first and second floor, north side – these will keep out dirt and weather while construction occurs. What will be the most notable architectural features of the renovated library? Scott Strawn: Some of the biggest include having the coffee shop move from the basement of the commons to the library, having a large office suite for the Center of Student Success and and a living room for commuter students. Katie King: In addition to Scott’s observations, renovation will feature a more hospitable (and well-designed) atmosphere for all students, including an outdoor patio! Additionally, we’ll clear space on the third floor of the Library to replace student study space and collection space that is displaced by the Center for Student Success. How will students be affected as the library is under construction? Katie King: The availability of space will ebb and flow as construction progresses. Also, the Library will be noisy, and silent study locations will be hard to find. However, evening hours should be much quieter. We appreciate your patience as we do our best to accommodate your study needs during construction. Scott Strawn: There will be times when both the north and south sides of the library will be closed. We do want to keep that to a minimum though. In particular we want the second floor to be available to students during midterms and finals. Scott Strawn: Our continual goal is to connect students to resources to improve upon and enhance their learning and ultimately their success- which we define to a large part by each student earning a degree. By remodelling the library we hope to further this goal. Katie King: Most people know the Library is the academic heart of any campus (not that I’m biased at all). A large part of the Library’s mission (as the academic heart) is to extend everyone hospitality by serving your research and resource needs (especially students’ needs). 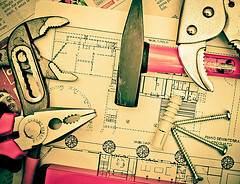 We hope renovation will help us better connect you to the resources you need, whether those are librarians, books/e-books, articles, archival material, space, or academic support via the Center for Student Success.